Seriously?! The rain has to stop. Whether impacting outdoor sporting events, or simply an inspired attempt at raking leaves, the weather in the Northwest is downright precipitous. Then again this is what we have come to expect being so close to the Pacific Ocean. It isn’t all bad though as New Belgium is reminding us that another of their so-called Winter beers is now ready for consumption. 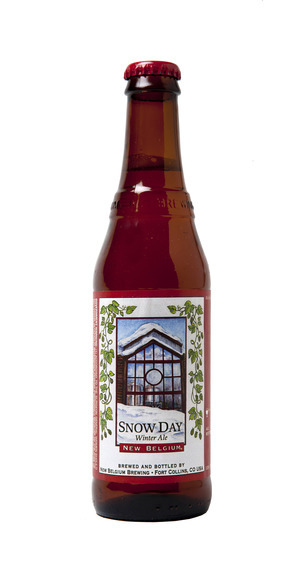 Snow Day as it has been named is a Winter Ale that could be equated as a skiers’ energy drink. Obviously this writer doesn't condone skiing under the influence but this beer was brewed in a state known for it’s ivory slopes. Whether you’re shushing through the champagne on Colorado’s ski slopes or reading Chaucer by the fire (it happens! ), New Belgium Brewing’s Snow Day brings a taste of Colorado winter to you. This is Snow Day’s second year as the brewery’s winter seasonal, available now through January. Snow Day offers subtle chocolate and caramel flavors from the Midnight Wheat malt. Its layers of hops include the Styrian Golding, Centennial and Cascade varieties, complementing the beer’s roasty undertones with a pronounced hop blast and a dry finish. Snow Day has 6.25 percent ABV and 55 IBUs. Look for this and their other Winter beer, Frambozen, wherever you find Fat Tire. New Belgium Brewing Company, makers of Fat Tire Amber Ale and a host of Belgian-inspired beers, began operations in a tiny Fort Collins basement in 1991. Today, the third largest craft brewer in the U.S., New Belgium produces nine year-round beers; Fat Tire Amber Ale, Sunshine Wheat, Blue Paddle Pilsner, 1554 Black Ale, Abbey, Mothership Wit, Ranger, Belgo IPA and Trippel, as well as a host of seasonal releases. In addition to producing world-class beers, New Belgium takes pride in being a responsible corporate role model with progressive programs such as employee ownership, open book management and a commitment to environmental stewardship. For more information, visitwww.newbelgium.com.